Chanukah – What is it? Actually, far from celebrating “diversity” or “tolerance” or “respect for every faith,” Hanukah (the name means “dedication” in Hebrew) marks a singular display of intolerance– when religious zealots, exalting the values of “that old time religion,” came into the Temple in Jerusalem and drove out all alternate, “creative” forms of worship. In the “For the Miracles” (Al HaNissim) prayer recited at least three times a day by religious Jews during the eight days of the festival, we salute this uncompromising assertion of absolute truth: “Your children came to the Holy of Holies of Your House, cleansed Your Temple, purified the site of your Holiness and kindled lights in the Courtyards of Your Sanctuary.” No, the fervently faithful rebels did not assign a special area for other religious impulses as part of some ancient commitment to multiculturalism. Here are some reflections on Chanukah, mostly from my friend Amb. (Ret) Yoram Ettinger, but modified some by me. The meaning of the word, Chanukah in Hebrew is Inauguration or Dedication. 1. CHANUKAH’S UNIQUENESS. Chanukah is the only Jewish holiday which commemorates a Land-of-Israel national liberation struggle, unlike Passover (Exodus from Egypt), Sukkot & Shavouot (on the way to the Land of Israel), Purim (Persia), etc. 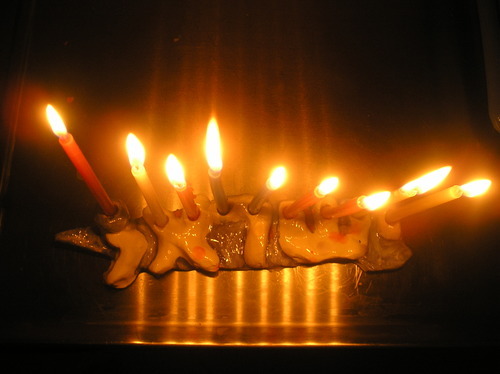 Chanukah is the longest Jewish holiday (8 days) with the most intense level of Light (8 consecutive nights). 2. SEVEN CHANUKAH -LIKE EVENTS: Chanukah of the Creation (Genesis 2:1-3), Chanukah of the Sanctuary (Numbers 7:1-11), Chanukah of the First Temple (Kings 1, 7:51, 8:1-11 & 62-66), Chanukah of the Second Temple and the Ingathering (Ezra 6:13-18), Chanukah of Jerusalem’s Wall (Nehemiah 6:15-16), Chanukah of the Temple Priests in 165BC (Maccabees 1, 4), Chanukah of the After World. Some attach the significance of each Chanukah to a corresponding day of the Creation. 3. ORIGIN OF THE NAME, CHANUKAH: THE HOLIDAY OF EDUCATION. According to the first book of Maccabees, Yehuda (who succeeded Mattityahu, the priest) ordered the Jewish People to observe an eight day holiday on the 25th day of the month of Kislev, in order to commemorate the inauguration or dedication of the holy altar and the Temple, following Syrian desecration of the Holy site. A key feature of Chanukah is EDUCATION of the family (The Hebrew word for education is CHINUKH, spelled with the first four of the five letters of Chanukah). The Hebrew word, Chanukah, consists of two words, CHANU (they rested/stationed) and KAH (25), which refers to the fact that the Maccabees re-consecrated the Temple on the 25th day of the month of Kislev (purging it from the idolatries installed by the Seleucids). Some have suggested that the celebration of Christmas on December 25th and the celebration of the New Year 8 days later (January 1) have their origin in the 25th day of Kislev (which always “accompanies” December) and the 8 days of Chanukah as well as the 8 days of circumcision. 4. ORIGIN OF THE NAME, MACCABEE. Yehuda’s middle name was Maccabee, derived possibly from the Hebrew word MAKEVET (The Power Hammer), which described Yehuda’s tenacious fighting capabilities. It may have derived from the Hebrew verb CABEH (to extinguish), which described the fate of Yehuda’s adversaries. Another possible interpretation of the name is that MACCABEE is the Hebrew acronym of “Who could resemble you among Gods, Jehovah” (“Mi Camokha Ba’elim Adoshem” in Hebrew). 5. LEGACY OF THE MACCABEES: Faith, moral clarity, long-term vision, defiance of odds (the few against the many), willingness to sacrifice short-term convenience on the altar of long term national security, and awareness that nations who do not adhere to their roots and are not willing to sacrifice for Liberty forsake their future and do not deserve Liberty. NO FREE LUNCH FOR SOVEREIGN PEOPLES, especially in violent and unpredictable neighborhoods. 6. HOLIDAY OF LIGHT AND REMEMBRANCE. The first day of Chanukah – the holiday of light – is on the 25th day of Kislev, the month of miracles (e.g. Noah’s Rainbow appeared in Kislev). Moses completed the construction of the Holy Arc on the 25th day of Kislev, as was the date of the laying the foundation of the second Temple by Nehemaya. The 25th (Hebrew) word in Genesis is LIGHT (“OR” in Hebrew). A Jewish metaphor for the Torah is light. The 25th stop of the People of Israel – on their way from Egypt to the Promised Land – was Hashmona (same root as Hasmoneans in Hebrew). Chanukah commemorates the victory of Light (Maccabees) over Darkness. While light stands for remembrance, darkness (Chashecha in Hebrew) stands for forgetfulness (Schichecha in Hebrew, spelled with the same Hebrew letters as Chashecah/darkness). 7. CHANUKAH DEMONSTRATES THAT WISDOM IS SUPERIOR TO KNOWLEDGE AND UNDERSTANDING. Jewish definition of intellect and Jewish history demonstrate the superiority of Khokhma (faith in divinely inspired wisdom, morality and capabilities) over Beena (human understanding and interpretations) and Da’att (human intelligence/knowledge). The Greek/Syrian culture was based on the superiority of human knowledge and (tenuous) moral standards. The Greeks/Syrians felt constrained, and therefore threatened, by Jewish faith in divine (permanent) morality. Chanukah demonstrates the victory of divine morality over convenience-driven human definition of morality. 8. EIGHT DAYS OF CHANUKAH REPRESENT DIVINE CAPABILITIES AND OPTIMISM. The ancient Temple Menorah consisted of seven branches, which commemorated the seven days of creation. The Chanukah Menorah has eight branches, reflecting the additional level of divine capabilities over and beyond human expectations: The victory of the few over the many and the lasting of one day supply of oil for eight days. Some have suggested that the eight day celebration was designed to make up for the holiday of Tabernacles, which could not be celebrated by the Maccabees due to the war. The shape of “Eight” represents infinity: No end to divine capabilities to enhance human fortunes, as evidenced by the survival of the Jewish People against all odds. The root of the Hebrew word for “eight” (Shmonah) is “oil” (Shemen), which is also the root of “Hasmonean” (Hashmonayim). 9 A LESSON TO ISRAEL’s LEADERSHIP: Simon the Maccabee – who succeeded Judah and Jonathan the Maccabees – responded to an ultimatum by the Assyrian/Greek Emperor Antiochus (Maccabees A, Chapter 15, verse 33: “We have not occupied a foreign land; We have not ruled a foreign land; We have liberated the land of our forefathers from foreign occupation.” Thus responded Simon the Maccabee to Emperor Antiochus’ ultimatum to end “occupation” of Jaffa, Jerusalem, Gezer, Ekron and Gaza. 10. THE INSPIRATION FOR BENJAMIN FRANKLIN’S “REBELLION AGAINST TYRANTS IS OBEDIENCE TO GOD”. The Maccabees were a tiny minority – condemned by the “pragmatic” Jewish establishment (the left of those days?) – upon launching their rebellion against an oppressive super-power. They were referred by Jewish “intellectuals” as “the enemies of peace” and “extremists.” They prevailed due to their principle-driven, determined and can-do state-of-mind. They have demonstrated the victory of the few over the many, right over wrong and truth over lies. The Maccabees have become a role-model for America’s Founding Fathers, including Paul Revere and the organizers of the Boston Tea Party. 11. ORIGIN OF PATRICK HENRY’S “GIVE ME LIBERTY OR GIVE ME DEATH” and NEW HAMPSHIRE’S “Live Free Or Die”. The Maccabees’ sacrifice and political Incorrectness has preserved and inspired today’s Jewish religion, language, culture and sovereignty. They followed in the footsteps of Abraham, Pinchas the High Priest, Joshua & Calev, King David and Elijah. 12. HISTORICAL CONTEXT. Alexander The Great – who held Judaism in high esteem and whose Egyptian heir Ptolemy II translated the Torah to Greek – died in 323BC following 12 glorious years at the throne. Consequently, the Greek Empire disintegrated into five, and thirty years later into three, kingdoms: Macedonia, Syria and Egypt (this was pre-Islam). The Land of Israel was always militarily contested by Syria and Egypt (and Gaza was always the main invasion route!). In 198BC, Israel was conquered by the ancient Syrians. In 175BC, a new king assumed power in Syria, Antiochus (IV) Epiphanies, who viewed the Jews as pro-Egyptians and held Judaism with contempt. In 169BC, upon his return to Syria from a military victory over Egypt, he devastated Jerusalem, massacred a large number of Jews, forbade the practice of Judaism (including the Sabbath, circumcision, etc.) and desecrated Jerusalem and the Temple. The 167BC-launched rebellion against the Syrian (Seleucid) kingdom featured the Hasmonean (MACCABEE) family: Mattityahu, a priest from the town of Modi’in, and his five sons, Yochanan, Yehuda, Simon, Jonathan and Elazar. The heroic (and tactically creative) battles conducted by the Maccabees, were consistent with the reputation of Jews as superb warriors, who were hired frequently as mercenaries by Egypt, Rome and other global and regional powers. 13. CHANUKAH-PASSOVER-PURIM. The heroes of Passover and Purim had no choice but to defy their enemies. The Maccabees refused physical peace in return for spiritual assimilation and a sellout of the cradle of Jewish history. They were willing to pay any price for the protection of their values and heritage. Chanukah symbolizes the victory of conviction and roots over short-term convenience and over opportunism/cynicism (currently known as “Realism” or “pragmatism”).